Mr. Sax T, Virtual saxophone from Sample Modeling. 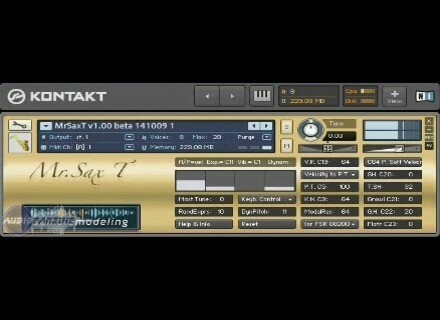 Sample Modeling has released updates for Mr.Sax T (v1.02) and The Trumpet (v2.01a). Symmetrical ("keyboard-like") and asymmetrical ("natural") PitchBend behaviour. Improved "bite"-vibrato for EWI wind controllers. Transpose window (MIDI transpose function, not accessible via the Kontakt Tune or Transpose controls). Instrument range extended to D#5 (sounding). All_Note_Off button (if "on", produces all note off on CC120-121-123). Improved legato/portamento behaviour, especially on larger legato intervals. New Portamento Time mode (3 modes: Velocity, CC5, CC5 inv, for various wind controllers). The progressive increase of the CPU load is no longer present. Legato now optimally works with all Wind Controllers. Check out www.samplemodeling.com/en for more info. Retro Sampling Oscillator Pak - Sampler Synth Elements Retro Sampling has announced the release of Oscillator Pak - Sampler Synth Elements, a Maize Sampler-based waveform ROMpler containing a selection of waveforms for alternative synth programming.